"Alcor is the debut LP by a new voice from the Australian wilderness. Hailing from Ferntree Gully, Victoria, the music of Astor has thus far been appreciated only via a string of barely-distributed CDRs. Alcor gathers together the prime of these micro-editions and presents the material as a seductive and puzzling new whole. Field recordings of humble organic activity bend against a foundation of discreetly processed electronics/piano, creating sonorities that are as undefinable as they are unforgettable. Alcor is the ideal LP for fans of fringe position electro-acoustic study, Delphic audio confusion, or anyone who pines for the days when Small Cruel Party still roamed the earth. Mastered by Graham Lambkin, Alcor arrives in a full color high gloss sleeve, in an edition of 350 copies." - Kye. "Kye is proud to present Inland, the new LP by Clapton-based Astor. Advancing the cause of 2012s Alcor LP, Inland finds Mark Harwood and sometime collaborator Maja Larsson further complicating reason with dark and circuitous audio constructs. Taking its inspiration from Gerard Murnanes 1988 novel of the same name, Inland explores a personalized perception of space, both real and imagined, returning a fabricated dreamworld which teases logic and tricks the ear. Conceived with piano, bells, tapes, gong, autoharp, hammer, t.v., organ, and dry ice pellets, Inland cuts the face of expectation to expose a 10 part fractal sonic geography, governed by its own laws, and flushed with all the beauty and horror of the natural world. Inland arrives in a full color, high gloss sleeve, in an edition of 400 copies." - Kye. "Sunday Night, Sunday Afternoon is the debut LP by the duo of Marcia Bassett and Samara Lubelski. Both musicians have played crucial roles in the development of underground sound over the last 20 years, tinting the broad waters of abstract folk, chromatic noise and long form drone, and cementing themselves as cornerstone artists in the process. Sunday Night, Sunday Afternoon is the perfect synthesis of Bassett and Lubelskis individual crafts - two sidelong forays into deep black string meditation that hang in the air like ghosts on Ludlow Street. Sunday Night, Sunday Afternoon was recorded/mixed by Barry Weisblat in 2010 in Brooklyn, NY, and arrives in a high gloss monochrome sleeve, in an edition of 500 copies." -Kye. "Kye is proud to present The Paris Concert, the second installment in our Joe McPhee archival series, following 2015s To Be Continued. Recorded May 13th 2015 The Paris Concert documents a historical private performance held in a 5th floor Paris apartment to an invited audience of 15 people. 40 years after a chance meeting in 1975 at The American Center in Paris, Raymond Boni (guitar), Jean Marc Foussat (synthesizer) and Joe McPhee (tenor/pocket trumpet) reunite with an impromptu private concert. This is music in the moment, walking naked on a razors edge. The American Center is long gone and in 2015 The City of Light strives for a new meaning in a time of great challenge. The world has changed and we all walk naked on a razors edge. (Joe McPhee, 2016). The Paris Concert arrives in a full color Matthew Revert designed sleeve, and comes with a download card containing the full recording of the concert including the encore (not featured on the LP), as well as photographic documentation by Christine Baudillon, in an edition of 400 copies." - Kye. "the bowles were a briefly extant australian trio of matthew p. hopkins, christopher schueler (r.i.p.) and mary macdougal. they came together in 2009 and plied their craft across the patchwork of warehouses, attics and d.i.y. artspaces connecting the blue mountains of new south wales to inner city sydney before imploding later that same year. although their time with us was short, the bowles creative bloom was towering and unforgettable. the bowles ep presents a six track overview of the groups modus operandi, recorded live to dictophone in sydney. murky cassette montages, strung out 3am ballads and exquisite corpse-style constructs unify and define an original voice that few have heard, until now. the bowles ep arrives in a pro-printed full color sleeve sporting mary macdougals painting getting together, and includes a full color bowles postcard, in a limited edition of 350 copies." -Kye. "This is it. The debut release by Call Back The Giants, the new project by former Shadow Ring keyboard governor Tim Goss. Two helpings of brooding synth melodrama, delivered in classic home studio style. These are songs that speak of internal struggle, of consoling brutality, of a fantasy world where the author is king. For fans of Jasun Martz, Dr. Jeff Meldrum, Whitehouse, Lighthouse/"Lindus" and the many songs Goss has privately sung across the years. May these songs now be heard. Arrives in one of three sleeve designs, each exposing a variant of the yeti/sasquatch profile, in a hand-numbered edition of just 100 copies. So this is it. This is the time." - KYE. "This is it. The debut LP by Call Back The Giants, the new project by former Shadow Ring keyboard governor Tim Goss. Fans of the recent Kye 7" will be thrilled to know that is LP is equally invested with strange, elegant horsepower. This is truly a record without a home. A record at odds with both the bottom feeders of the trad-folk revival, and the new merchants of digital gloom. With this LP Call Back The Giants offer up a Black Box of homespun mystery. A timeless attest to the worth of solitary vision.." - KYE. Repress of 200 copies. "Kye is proud to present the long-awaited new LP by Folkestones Call Back the Giants. The Marianne takes the questing, narrative themes last heard on The Rising LP (2011) and Incidents of Travel EP (2012) and extrapolates them into a three-part conceptual odyssey. Set aboard the cruise liner of the same name, The Marianne charts the epic voyage of Capt Fletcher and his patrons as they passage across the sour ocean, through a prism of supernature and on toward an uncertain end. The Marianne arrives in a full color, high-gloss, Chloe Mutter-designed sleeve, on sea-foam green vinyl in an edition of 400 copies." - Kye. "Call Back The Giants first surprised and delighted the listening world in 2010, with their warmly-received eponymous debut album. Since that time, the duo of Tim Goss and Chloe Mutter have been locked in perfect isolation, teasing every nuance of their sound into sharp focus. The Rising presents the results of their toil, exposing Call Back The Giants as true masters of cryptic intent. Homespun keyboard minimalism, wavering teenage laments, and foreboding pronouncements of doom, synthesize into new, original matrices of thought. The Rising also introduces the guitar heroics of some-time third member, Big Rob Stewart, who lays down the law in crude basement style. The Rising is a masterpiece of ambition, that meets the expectations of its audience head on. The Rising arrives in a full-color, high gloss sleeve, with photography by Krysztoff Dorion, in an edition of 1000." -KYE. "Kye is proud to present in association with Penultimate Press the fully authorized reissue of Henning Christiansens Kreuzmusik FLUXID BEHANDLUNG Op 189. Kreuzmusik FLUXID BEHANDLUNG Op 189 was commissioned by the Bonner Kunstverein Gallery, Kunstfond, Germany in August 1989, for inclusion in their Taking Fluxus Around for a Drive happening, (also featuring performances by Dieter Daniels, George Maciunas, Allan Kaprow, Al Hansen, Joe Jones and others) and originally issued on cassette in 1990 by Neue Bildende Kunst in an edition of 100 copies. Kreuzmusik FLUXID BEHANDLUNG Op189 arrives in a full color high gloss sleeve, with original score reproduction insert, mastered from the original tapes by Jason Lescalleet at Glistening Labs, in an edition of 500 copies." -Kye. Highly recommended! "The latest LP from veteran fluxus composer Philip Corner. OM Entering. and Once Enterd comprises four previously unreleased recordings with the Barton Workshop, taken from performances in the Netherlands, and South Korea, between 2000-2007. OM ENTRANCE. OM ENTERTRANCE. which one does....because the performance is a real "passage from the material to the spiritual" unless the "real" world is just as spiritual already which i like to think it is. As perhaps an everyday awareness is already to be entranced which i have been told it is, really. To the facts: musicians coming-in already the performance of everything has to be done to get ready from unpacking to tuning and all that is done in the concentrated and exalted spirit of real music. Multiplicity moves noise to instrument possibilities with virtuosity show-offs slowing down to a perfect tuning in a quiet circle from where there is nowhere else to go but the sustaining of a quiet long tone. My old friend and colleague also great composer Jim Fulkerson is there as he has be, as he was even at the first performance way back must be almost 50 years by now joining the Creative Associates at the University of Buffalo on his initiative as likewise these performances in Holland with his group he calls The Barton Workshop and for sure he is there playing trombone too. The movement from SANG/TEH (SITUATIONS). Guard duty in a cold Korean winter. This piece was a major turning-point in my work. My life too you-could-say. "Of Ancient Times and Modern Sounds" i wrote then: a better world---much much better---than being in the American Army. The heterophonic melody-only texture learned from their "Ah Ahk" court music ("Soo Je Chun" the most beautiful music in the history of the world!) imposed on a thoroughly modern chromatic note structure. Occidental instruments absorbing the traditions of subtle sound colours so-long absent from the West. Public performance in Seoul. That must have been the Spring of 1961 just before they "shipped me out", to bring all that back home. Before that the wonderful and exceptional opportunity to "run through" some of it with the indigenous instruments of the Koog Ahk Wun (National Music Institute) thanks to the cultural open-mindedness of the classical kayageum master Byungki Hwang. And Jim has not only played the 3rd movement often, but brought if back to Korea once at the Pan Music Festival. But my long-waiting-for performance in Korea on native instruments has yet to take place. The CHOPIN PRELUDE piece is one of two, reworking passages from his D Major Prelude for piano, and a part of the "as a revelation" series which "looks into" moments from the classics which usually go by too fast. Begun with Mozart, the series has "got a lot of mileage" out of Satie, as well as including Buxtehude, Bach, Rimsky-Korsakoff, Verdi, Ives, Berlioz,, and others." - Philip Corner, 2015. "Kye and Penultimate Press are very proud to present a collaborative release from Moniek Darge (Belgium) and Graham Lambkin (UK). "I have always been interested in sounds in general. When reading and teaching about the futurists, I fully agreed that the sound of engines and machines could be as interesting as the sound produced by musical instruments. But not only industrial sounds fascinate me - I also find the sounds of nature very inspiring. What I love to do is make soundscapes, and I try to give an impression of a certain space. I am fascinated by a lot of so-called sacred places in the world, in etnic cultures, but also in our own cities. I try to recall the atmosphere of such a place, the quietness, the subtile sounds, or simply whats happening. I started with places in Ghent, where I live, and little by little – I have always loved to travel – I began to think - hé, it would be nice to do the same thing at different places on earth. So I started to go to different countries with the purpose of making soundscapes. With our Logos Duo, ever since 1980, I was already travelling around the world to give concerts, and thus I already collected sounds from all continents. Lately Ive been traveling to India and recording the sounds typical in certain regions. You will hear sounds of traffic, of religious ceremonies, of commercial music, mixed with merchants voices, nature sounds. I asked my friend Graham Lambkin to join me in the creation of these Indian soundscapes. We had previously performed Tamil Nadu and an early version of Indian Weather Trap together in concert at Issue Project Room, NYC, 2011 alongside our friend Françoise Vanhecke. I further invited Graham to make his own Indian soundscape in his own style, using materials gathered online, to bring our CD to a close. So just sit back quietly and enjoy. Lets all travel together on the wings of sound." - Moniek Darge. Indian Soundies arrives in a deluxe full-color 6 panel digipack, in a limited edition of 400 copies." - Kye. Co-released with Penultimate Press. "Kye is proud to announce the release of Farm Stories, the second archival collection from the extinct duo of Adris Hoyos and Graham Lambkin. Unlike the hermetic Rise of Elklink LP, Farm Stories features creative use of the great outdoors, recorded in 2002 at Green Chimneys rehabilitation center for children and animals, in Brewster, NY. We hear pigs, birds, thunder, cows, children, their parents, and planes. These recordings were then fed through a mixing board where Lambkin added Kurzweil K2500 synth, and Hoyos added electric guitar and FX. The results were made into a private run CDR that was given away at Christmas to friends. This 2015 edition of Farm Stories has been restored from the original cassettes by Graham Lambkin and fully remastered by Jason Lescalleet at Glistening Labs. Farm Stories arrives in a full color high gloss sleeve that replicates the Elklink Christmas card of 2002 in an edition of 500 copies." - Kye. "The Rise of Elklink originally appeared as a cassette on the storied Polyamory label in 1999. Behind the ambiguous moniker lurked core Shadow Ring member Graham Lambkin, aided by Adris Hoyos with a cameo from fellow Shadow Ring bandmate Tim Goss. Although The Rise of Elklink was produced in tandum with The Shadow Rings Lindus LP, the two projects were different in intent. Song form and narration are replaced by walls of quiet, crumbling vocal concrete, meaningless stoned monologues and adjacent audio seepage, captured to 4-track in the backroom of a small Cuban crèche in Miami FL. This LP reissue restores all six tracks from the original cassette, and adds the Elklink contribution to the Colour In Absence Sound CD comp from the same year. Lovingly remastered by Jason Lescalleet at Glistening Labs, The Rise of Elklink arrives in a sleeve design based on the original j-card with a deluxe insert reproducing Brad Sonders classic period review, in a hand-numbered edition of 500 copies." -KYE. Highly recommended! "Kye is proud to present the eponymous debut LP by Australias Food Court. Centered around the core trio of James Rushford, Joe Talia, and Francis Plagne -- (alongside contributions from Yuko Kono, Chloë Smith, Alexander Garsden, Nat Grant, Simon Charles, and Callum GFroerer) -- Food Court present two live interpretations of Solages Fumeux fume par fumée, driving the curious nature of the original composition into radical and extreme new open space. Food Court arrives in a Karla Pringle designed full-color sleeve, with accompanying insert, in an edition of 400 copies." - Kye. A handful of "artist copies" of this 2011 release, each including a small portfolio of full-size insert prints by Tom Darksmith, in an edition of 38. "Million Year Spree is the first in an occasional series of shared LPs where two like-minded souls meet under one umbrella. Hamilton, Ontarios Fossils have long been the reigning kings of no-fi acoustic sewage, producing an endless stream of outstandingly dire handcut confusion. Calfornias Darksmith came to public attention last year via their peerless Total Vacuum LP (Hanson). Wilting electronics, floppy turntableism and sun-baked cassette protocol are combined and destroyed in a claustrophobic void. With additional mixing by Graham Lambkin and mastering by Jason Lescalleet Million Year Spree is the last word on being and nothingness. Hand-numbered edition of 400." - KYE. “Kye is proud to present “Cofradia Nautica” the debut LP by Chiles Glorias Navales, and the follow-up to 2015s “Carta a Maureen Tucker” cassette on ETCS. "Glorias Navales is a band based in Santiago, Chile, who combine local folk traditions and paganism with a post-Velvets aesthetic. Imagine Lou Reed, John Cale and Violeta Parra together, doing late night acoustic lo-fi trance jams in a rural area of Chile." (Ivan Daguer) Drawn from live concert tapes recorded at BYM Records, and recordings made in the bands private practice space “Cofradia Nautica” offers a raw, unvarnished walkway straight into heart the of the contemporary Chilean underground. “Cofradia Nautica” arrives in a full-color matte stock sleeve with printed innersleeves, mastered by Jason Lescalleet, in an edition of 400.” - Kye. Kye is proud to present Full Circle Sounding, the brand new LP by Montréal-based composer, improviser and violinist Malcolm Goldstein. Full Circle Sounding comprises the complete recording of Goldsteins headline set at the 2014 Kye Festival, which took place at Issue Project Room in Brooklyn, NY: Judson Piece #6 (with improvised violin extensions), "but one bird sang not", and Sheep Meadow (with improvised violin extensions), plus an additional new studio improvisation Soundings, recorded specifically to complement the Kye Festival set. Full Circle Sounding arrives in a monochrome matte stock sleeve featuring original Goldstein graphic art, and comes with a booklet of program notes/recollections." - Kye. "I follow the line, am molded by it, yielding, as I mold it like a brook after rain pours through dirt, rocks, trees and grass, finding new subtle twists and turns as things moved, are moved in the flow....." -Malcolm Goldstein. Edition of 500 copies. "Kye is proud to present a new 7" coupling from Philadelphias Good Area, expanding and refining the signature sound first heard on 2013s French Antarctica LP. Cubic Zirconia offers a coarse instrumental homage to the cubic crystalline form of zirconium dioxide, whereas Bad Karlshafen delivers a stark, text-based rumination on the breakfast habits of the Huguenots, collapsing ice-rinks and astral photography, bundled together in a vipers nest of non sequiturs. Cubic Zirconia/Bad Karlshafen arrives in a pro-printed full color sleeve, with numbered insert that replicates exactly the Golden Fish Market receipt of 10/12/13. Edition of 300 copies." -Kye. "Kye is proud to present French Antarctica, the debut LP by Good Area. Drawing from a palette of guitar, rhythm box, cornet, shortwave radio and room activity Good Area have crafted the ultimate stand-alone testament to instantaneous expression. Bypassing such obsolete concepts as dexterity and restraint French Antarctica cuts loose with a raw unbridled rush of creative force, bristling with home-spun malevolence and anti-social aplomb. Good Area harvest the wisdom passed down from the Decayes, Semool, Nishimura Alimoti, and other bastions of shoe-box cassette culture and transcribe their teachings into epic new screeds of confusion. French Antarctica arrives in a full color, high gloss sleeve, with commemorative postcard, in an edition of 400 copies." - Kye. "Helm is the ambiguous solo moniker of London-based sound architect Luke Younger. Although, perhaps best known as one half of the pioneering avant-drone outfit Birds of Delay, it is in the more esoteric work of Helm that Lukes art takes on its most radical shape. 2010s debut LP To An End confirmed that in an age of fleeting trends and fly-by-night fancies, there were still a few old souls prepared to knuckle down and deliver the goods that people want to receive. Cryptography carries forward that noble mindset, presenting a new five-part suite of expertly rendered electro-acoustic study. Using processed piano, Casio MT-40, cymbal and guitar strings Cryptography steers the Helm sound through a melange of fringe territories: glacial drone meditations, reconfigured gamelan clusters, and howling walls of organized feedback, all coalesced in classic UK post-industrial fashion. Indeed, had it been conceived of 30 years prior, it would be easy to imagine Cryptography winning a seat in the United Dairies, or Dom America catalog, such is its commitment to homemade exploratory zeal. Cryptography arrives in a full color sleeve, with insert, in a hand-numbered edition of 400 copies." -Kye. "Kye is proud to announce the release of Rules Of The Universe, a fully authorized anthology of archival audio work by the renowned Dutch artist Anton Heyboer (1924-2005). Heyboers stature in visual arts is well known and internationally celebrated, but documentation of his audio work is scant and difficult to locate. Heyboers only previous vinyl release - 1976s ill-fated She And She As One LP (EMI) introduced a music so resolutely personal and uncommercial in nature that EMI ordered the unsold bulk of the pressing withdrawn and destroyed. Further recordings of Heyboers anomalous music eventually trickled out via a string of private press micro-edition CDs/CDRs through the Anton Heyboer Foundation in the 1990s. Released with full approval from VOF Heyboer and overseen by Lotti Heyboer, Rules Of The Universe draws from over seven hours of surviving archival tapes, restoring the cream of the CDR editions and supplementing it with a selection of previously unheard tracks. Rules Of The Universe offers a fresh reappraisal of a lesser-known - but no less important field of creativity from one of the 20th Centurys most original artistic minds. Rules Of The Universe arrives in a full color high gloss gatefold sleeve, with an accompanying fold-out color poster, in an edition of 500 copies." -Kye. "Kye is proud to present The Annihilating Light, the brand new LP by Stefan Jaworzyn. For over three decades Jaworzyn has colored the varied waters of underground practice with his unique and darkly acerbic hue. His tenure in such genre-defining units as Skullflower; Whitehouse and Ascension/Descension, and his scholarly position on extreme cinema have awarded Jaworzyn his reputation as a counter-cultural impresario. He is equally regarded for his solo work, which has taken in everything from D.I.Y. cassette noise, rhythm box processions, to free guitar barbarism and beyond. Returning from a period of self-imposed exile Jaworzyn has re-organized his delivery into a synthesized charge of hard patterned electronics. The first rewards of this resurgence came last year via a pair of 12" EPs released through Jaworzyns revived Shock label. The Annihilating Light continues the story by showcasing two brand new long-form compositions. Oasis Of Filth unveils a brooding synthetic wasteland, percolating with malevolence and spite; Cast Out, by contrast, offers a head-crushing impasse of electronic stasis, fully flushed with classic anti-social potential. Expertly mastered by Jason Lescalleet at Glistening Labs The Annihilating Light arrives in a full color, high gloss sleeve, with black matte inners, in an edition of 500 copies." -Kye. “Kye is proud to present Lymph Est, the brand new LP by Matt Krefting. Kreftings chronology is a deep-rooted and complex one, seeded in the foundation of the Apostasy imprint, and the animation of its numerous transitory groups, most notably Son of Earth, of which he played a crucial part. Concurrently, Krefting has won a reputation for his solo tape-based work, circulated primarily in secretive micro-editions, before eventually reaching a wider audience via last years critically acclaimed High Hopes LP (Open Mouth). Lymph Est presents the advance of Kreftings march, and stands as the purist distillation of his art to date. Taking the common garden apparatus of cassettes, mics and amplification, Krefting constructs a music of rare simplicity and abundant mystery. Treated voices, piano, samples and T.V. grabs are ushered into a series of soft-focus miniatures that are built to be razed in a perpetual cycle of triumph and defeat. Lymph Est exists as a far-flung landscape where outline and definition are lost to time, and the fading signature of recall wanes to a pallid script. Mastered by Jason Lescalleet at Glistening Labs Lymph Est arrives in a full color Krefting designed sleeve, with complimentary innerbags/labels in an edition of 400 copies.” - Kye. "Kye is proud to present Abersayne/Attersaye, a brand new 7" single by Graham Lambkin, his solo debut on the format after 21 years in the game. Abersayne/Attersaye pairs a perfectly serviceable love song with a rough-and-ready late-night lament (featuring one conspicuous overdub). Expertly mastered by Jason Lescalleet at Glistening Labs, Abersayne/Attersaye arrives in a pro-printed full color high gloss sleeve, with lyric insert, in an edition of 500 copies." -Kye. "Amateur Doubles is the brand new solo LP by Graham Lambkin -- two-part improvisation recorded in a Honda Civic. Dangerous, tedious, pointless and timeless, Amateur Doubles is a perfect snapshot of life on the open road. Expertly mastered by Jason Lescalleet, Amateur Doubles arrives in a high gloss full color gatefold, on clear vinyl, in an edition of 500."-Kye. "Kye is proud to announce the release of Community, the new solo LP by Graham Lambkin, following 2011s Amateur Doubles. Community is a music steeped in sociological review. It sits as a keen barometer, taking the temperature of the world around it. Community is both willing servant and social mirror - it performs its basic civic duty without fuss, then shatters. (José Perez, downstairs neighbor). Mastered by Jason Lescalleet, Community arrives in a deluxe matte finish gatefold with corresponding printed inner-sleeves in an edition of 500 copies." - Kye. "Poem is Graham Lambkins (Shadow Ring, Tart, Transmission, etc..) first solo LP, and it is a doozy. Slowed down voice, water sounds, a little bit of radio, and some odd hisses and hums all combine for a very linear and yet insane listening experience. The sound soon becomes a strange syrup that surrounds the listener in its devilishly well-crafted coccoon. The editing is very subtle, but very rewarding to the patient listener. And: (1) this is one of the top records to listen to with that last drink at 5 or 6 AM (it works! ); and (2) this can easily sort out the contenders from the pretenders at any social gathering. A real favorite of mine." - Scott Foust. "This is the first release of all new material in six years. Salmon Run is an epic confusion of high and low art. A place where vocal gymnastics, water gardens, string quartets and broken beer bottles can mix openly together, creating new and fantastic constructs of sound. Salmon Run was originally going to be a concept CD about the North American Sasquatch. Its great to be back." - Graham Lambkin. New release from 1/3 of the Shadow Ring. "Softly Softly Copy Copy is the brand new CD by Graham Lambkin, following on from 2007s Salmon Run (Kye) and 2008s collaboration with Jason Lescalleet The Breadwinner(Erstwhile). Softly Softly Copy Copy is a two-part tape composition - a shoreline odyssey where man and beast wrestle for absolute rule. Recorded and mixed in upstate New York over a two year period, and aided by the talents of Samara Lubelski -violin, and Austin Argentieri -acoustic guitar. Mastered by Jason Lescalleet at Glistening Labs. Comes housed in an elegant 4 panel digipak." -KYE. "Jason Lescalleet has been a monolithic presence in underground culture for nigh on 15 years. Here towers a man who has steadily advanced a music of great focus and originality. A man whose craft is born from that which others pronounce dead. Jason Lescalleet stands at the intersection where musique concrète, power electronics, tape composition and minimalism touch. His is a voice that is heard on the world stage. That is recognized and described. Through his recorded work and in live performance Jason has known the company of such great men as Joe Colley, John Hudak, Phill Niblock and Greg Kelley, to name but few. His art has found publication on such revered imprints as RRR, Erstwhile and his own Glistening Labs. And it is with no small pride that Kye now adds itself to the list. Fantasy and Electricity is Jason at his most forward-facing. A shimmering futuristic stomper pried from the ballrooms of Cologne, whilst Dictophone Music/Organ Music offers two miniature studies, both rich in granular detail. Fantasy and Electricity arrives in one of three sleeve designs each sporting original photography by Jason, in an edition of only 100 copies. For the fortunate few the fantasy is about to become a reality." - KYE. "Kye is proud to present Much To My Demise, the brand new solo LP by Jason Lescalleet. Since establishing himself as a preeminent voice in contemporary electro-acoustic study, Jason Lescalleet has, through his solo work and in collaboration, exploded the notion of what is possible within the realm of tape-based music. His recorded catalog acknowledges a diversity of application, from lo-fi reel-to-reel soundscaping and work for hand-held cassette machines, on through to digital sampling and computer generated composition. Lescalleets live actions further expand his ouevre to include work with video, dance, performance art and multi-media concerns. In recent years Lescalleets work has done much to explore the theme of loss and decay as sound - Another Example Of Parkinsons Law (2001), Ineinandergreifen and Untitled (from Mattresslessness) (2002) and The Pilgrim (2006) all hold the concept of senescence at heart. Much To My Demise carries the motif of decomposition further still. Recorded and constructed solely with analog sources, Much To My Demise showcases the result of a three month process in which pre-recorded reels of tape were transported outdoors, buried in soil and encouraged to corrode. The reels were then excavated, and their resultant signals transferred and edited to form an apparitional triptych of faded gesture and mood. Much To My Demise shows Lescalleet at a new creative peak, crafting a music that is equal parts comforting and haunting, and allowing us access to secret world of sound hidden in plain sight. Expertly mastered at Glistening Labs, Berwick, ME, Much To My Demise arrives in a Lescalleet designed monochromatic reverse board sleeve, with card stock insert, on white vinyl, in an edition of 500 copies." -Kye. “Kye is proud to announce the release of “Clear and Cloud”, the debut LP by Alec Livaditis. Recorded over the summer of 2015, “Clear and Cloud” showcases Alecs unique vision for extended cello technique across two varying settings. Side As "Clear and Cloud" presents Livaditis (cello, objects) and Killick Hinds (Vo-96 guitar) live in an extraneous sound environment, where music and conversation seek to undermine each other in a morose and thrilling tussle, whereas Side Bs “Through The Open Window” finds Livaditis alongside John Kiran Fernandes (clarinets, violin) in a discrete collage of live/studio improvisations that test the elasticity of form and structure. Mastered by Jason Lescalleet at Glistening Labs, “Clear and Cloud” arrives in a full color Lee Turner designed sleeve, in an edition of 400 copies.” - Kye. "Kye is proud to announce the release of HH the new LP by Gabi Losoncy. HH bundles two sides of psychologically dense nothingness into one perfectly realized whole. Clear vinyl. Losoncy-designed packaging. Final Kye release. The coffin lid comes down on the rainbow. Edition of 300 copies." - Kye. "Kye is proud to announce the release of Absence, the new LP by Maths Balance Volumes. Side A presents material recorded live at the Arts Center of St. Peter, Minnesota as part of Free Form Freakouts An Evening of Experimental and Improvised Sound (04/21/17) while Side B gathers unreleased home recordings from the previous decade. Visionary cassette-based constructs with enough crude mechanics and smudged internal logic to delight the corpse of Arthur Pétronio. Edition of 250 copies." - Kye. "Kye is proud to present the release of To Be Continued, a previously unpublished 1973 performance, documenting the first meeting of Joe McPhee and John Snyder. "On a Sunday afternoon in the summer of 1973, a group of mostly non-professional musicians/music lovers, literally friends and neighbors came together to present a concert in a communal ritual ANCIENT TO THE FUTURE, for friends and neighbors at Holy Cross Monastery in West Park, NY. The Episcopal order graciously made their facilities available for concerts in 1968 and my first recordings for CJRecords -Underground Railroad in 1968. Just a few months earlier I met John Snyder, who had recently acquired an ARP2600 analog synthesizer and immediately the "what if" scenario of such a musical adventure moved from imagination to reality." (Joe McPhee). Mastered by Jason Lescalleet at Glistening Labs, To Be Continued arrives in a full color hi gloss sleeve, featuring archival photos from the concert, and comes with an insert containing program notes/recollections by Joe McPhee, and a download card to access the complete unedited 60 minute concert recording. Edition of 500 copies." - Kye. "Kye is proud to present Seattle Symphony, the new LP by Poughkeepsies Joe McPhee. Seattle has become my home away from home, my second city, since first being invited to join trombonist Stuart Dempster for duets in 1984. When the opportunity for a solo concert arose, I learned of the passing of Bill Dixon and Fred Anderson and decided to make the focus of the performance a celebration of the lives, and music, of these two legendary heroes, who both passed away in June of 2010, within 8 days of each other. (Joe McPhee). 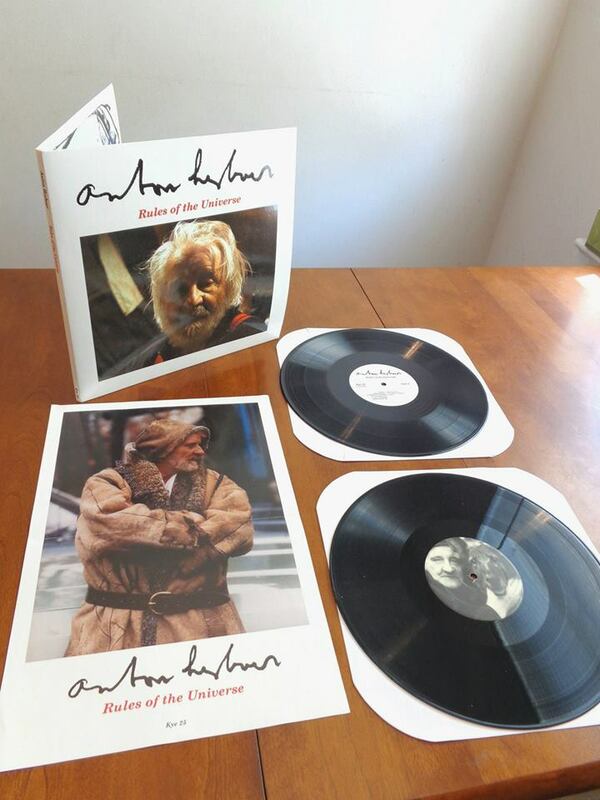 Seattle Symphony arrives in a full color high gloss sleeve in an edition of 300 copies." - Kye. Second edition. Recorded at Empty Stage, Poughkeepsie, NY, Sept 28th 2015. Joe McPhee: Pocket synth, chimes, whistle. Graham Lambkin: Tapes, objects, whistle. "Kye is proud to present Home of the Blues, the latest LP by Dan Melchior, and his sophomore effort for the label following 2012s now legendary Excerpts (& Half-Speeds). For Home of the Blues Dan agreed to undergo a series of exercises aimed not only at destabilizing his natural songwriting process, but also testing the durability of the blues idiom when placed under stress. As one would expect, Dan met the challenge with aplomb, hoisting the project beyond some one-dimensional art-school prank, toward a sincere and multi-faceted presentation of damage and survival as sound. Home of the Blues arrives in a full color, high gloss sleeve featuring original artwork by Dan, with an accompanying 18" x 24" foldout poster, in an edition of 400 copies." - Kye. "Kye is proud to announce the release of Moonrise, the brand new solo LP by Michael Morley. After a 30-odd year history cutting electric music with the likes of Wreck Small Speakers on Expensive Stereos, The Dead C, and Gate, Morley opens a new chapture with Moonrise, being the first readily available document of the man in solo acoustic mode. "Moonrise was recorded as an experiment in my newly established recording studio to see what might happen if I played acoustic instruments only, with an ear to some early Spanish guitar music and the Persian oud. After 30 years of playing the acoustic guitar in private for no good reason, I decide to record the activity." (Michael Morley). Moonrise arrives in a full color Morley designed matte stock sleeve, with complimentary inner bags, in an edition of 500 copies." - Kye. "Kye is proud to present Being Small, the new LP by Matthew Revert. Lovely collection of Matthews philosophies, worldviews and wisdom recorded cheaply at his home in Melbourne, Australia. Being Small arrives in a Matthew Revert designed sleeve with matching labels in an edition of 300 copies." - Kye. "Kye is proud to present the first fully authorized collection of sound work by esteemed Australian novelist Matthew Revert. Not You takes Reverts diaristic/voyeuristic narrations and casts them against a loose-footing of home-recorded 4-track scrabble, iPhone overload, and migratory acoustic dreamsong. These constituent parts combine and flourish in a creative rite of passage that affirms Not You as both hermetic tour-de-force, and masterpiece of primitive self-expression. Mastered by Jason Lescalleet at Glistening Labs, Not You arrives in a high-gloss Matthew Revert designed sleeve, with accompanying insert, in an edition of 400 copies." - Kye. "Vanessa Rossetto is a composer and painter living in Austin, Texas. She uses primarily chamber instrumentation, field recordings, electronics and a wide array of different objects, exploring them through extended and traditional techniques. In 2008, she launched her own CD-R label, Music Appreciation, and through this imprint has released four solo albums: Misafridal, Imperial Brick, Whoreson in the Wilderness and the award-winning Dogs in English Porcelain. Her most recent release, the PDD-NOS (Period Tapes) cassette was described by Byron Coley in The Wire as sounding like being under attack from slow-moving dune worms. Mineral Orange presents four new works, each showcasing Vanessas deep commitment to abstract sound situations. These pieces exist as precision-edited travelogs of Vanessas questing. Local sounds, audio verite and overlayed string interludes are scrambled into surreal matrices of time, place and event. Mineral Orange was recorded and produced in Austin, Texas in 2010, with additional production by Steven Flato and mastering by Jason Lescalleet at Glistening Labs, ME. Mineral Orange arrives in an elegant Rossetto-designed sleeve, in a hand-numbered edition of 300 copies." - KYE. “Kye is proud to present Whole Stories, the brand new LP by Vanessa Rossetto, and her third for the label following Mineral Orange (2010) and Exotic Exit (2012). Like its predecessors Whole Stories takes as its clay the sounds gathered from commonly found habitual environments, reshaping them into two extraordinary new long form compositions. This Is A Recorder enumerates the colorful events of a drunken birthday weekend lost to Mardi Gras, New Orleans between Feb 8th-13th 2013. Localized field recordings and conversational excerpts are combined with violin/electronics and processed into a detail-rich diaristic plateau that perfectly captures the heady climate of the source. Whole Stories by contrast, examines the dichotomy of luck verses agency, employing as its basic material the roseate whirl of a casino hall as backdrop to a slowly unfolding narrative that reflects on a life ravaged by disappointment and woe. Mastered by Graham Lambkin at Empty Stage Studios, Whole Stories arrives in a full color Matthew Revert-designed sleeve, with complimentary innerbags/labels in an edition of 400.” - Kye. "Manhunter is the brand new LP by Australias James Rushford and Joe Talia. The duos previous work, Palisades (2009) and Paper Fault Line (2011), showcased a gestural and timbrally rich music, bristling with keen detail and sharp edits. Manhunter stands in stark contrast - an ebbing two-part suite for waning greyscale electronics, dehumanized drum machine, amorphous vocal fragments, and sundry devices, woven together in a fabric of despair. The exquisite bleakness of Manhunter ties it to La Mutazione, Abandoned Cities, Theme From Hunger, and other great downer classics of yore. Manhunter arrives in a full-color high gloss Michael Salerno designed sleeve, with complimentary labels, in an edition of 400 copies." -Kye. "The Shadow Ring formed in the seaside town of Folkestone, England in 1993. Over the course of a decade, and through eight LPs, Graham Lambkin, Darren Harris and later Tim Goss scraped out a unique musical pathway for themselves, armed with only the barest of tools. With each release the Shadow Ring presented themselves as a group in constant flux. Naive acoustic improvisations, dour bedroom sci-fi epics, cryptic D.I.Y. theatre and glacial electronic soundscapes all became fair game in their hands. The group recorded for some of the premier underground labels of the era: Siltbreeze, Corpus Hermeticum, Swill Radio and their own Dry Leaf Discs were all at one time or another called home. The Shadow Ring were also champions of the absurd -- never playing live in their home country, they instead performed 23 shows across the US between 1995-97. The life of the Shadow Ring finally came to pass on the banks of the Hudson River in 2003. Life Review offers a celebration of the Shadow Rings oeuvre -- from the green chaos of 1993s Dont Open The Window 7" on through to the austerity of 2003s Im Some Songs LP. Featuring material from each of their albums: City Lights, Put The Music In Its Coffin, Wax-Work Echoes, Live In U.S.A., Hold Onto I.D., Lighthouse, Lindus and Im Some Songs, alongside 7" A and B sides, comp appearances, and a clutch of previously unreleased live and studio work, Life Review is an anthology that will serve both the aged fan, and the curious newcomer. Expertly mastered by long-time enthusiast Bhob Rainey, Life Review flushes out the rich sonic detail of the Shadow Rings music like never before. Housed in a deluxe six-panel digipak, with an accompanying 16 page color booklet of photos, flyers, sleeve art etc, Life Review also offers an untainted visual history of the group. With 34 tracks -- personally chosen by Graham Lambkin, and a running time of 154 minutes, Life Review offers the perfect chance to say a final farewell. One more time." -KYE. Very highly recommended! "Remains Unchanged is the long-time-coming archival overview of the Shadow Ring. Spanning the full decade of their existence, Remains Unchanged offers an alternate account of the groups labor, told through 20 never-before-heard tracks across two LPs. From the lumbering monotony of 1993s Squawk with Me to the funereal glory of 2003s And What If, Remains Unchanged grants the listener rare access to the secret history of Cheritons greatest underground export. Mastered from the original tapes by Jason Lescalleet, Remains Unchanged arrives in a full color high gloss gatefold sleeve, with fold-out wall poster in an edition of 1000 copies." - Kye. “Kye is proud to present “Nice Weather for War” - the fabulous new release that showcases six of the most exciting music artists working today. Featuring exclusive, never before heard material by Shots, Blue Chemise, Gabi Losoncy, Russell Walker, Matthew Revert and T.D. “Nice Weather for War” arrives in a 4-panel high gloss digipak with accompanying 8-page booklet in an edition of 400 copies.” - Kye. "Kye is proud to present “Lend an ear, leave a word” the new LP from Glasgows Mark Vernon. "The pieces composed for this album combine field recordings of contemporary Lisbon with found tape recordings from the past; reel-to-reel tapes, micro-cassettes and Dictaphones collected from the Feira de Ladra market, a popular and lively flea market in the Alfarma district. Each tape recording is an audio snapshot of a specific time; a family album in sound, a musical performance, a compilation of treasured music, or even just the fun of playing around with a tape recorder captured for posterity. Every thoughtless edit or push of the record button teleports us to a different time and place. The musical material extracted from the tapes is also an evocative signifier that locates it within a specific era. The interesting thing is how the tapes accumulate different strata of time even within a single side.There are consecutive chronological recordings but also sequences with unexpected breakthroughs where the user has carelessly fast-forwarded through the tape, randomly ‘dropping-in’ new recordings. These accidental edits create instantaneous new collages of sounds and voices. I have endeavoured to retain the essence of these unintentional edits and unexpected outbursts in the pieces I have assembled here. The noisy whir and clicking of the various tape mechanisms is evident on many of the found recordings. As the material is sped up and slowed down it acts as an internal clock, a continuous, steady marker of time, almost like the second hand of a timepiece. All of the pieces contained here within explore one particular environment - the city of Lisbon. Field recordings by their very nature are time-based but the introduction of found tapes into the mix expands the time-scale of these studies from just the short period spent in the city making recordings, backwards to possibly forty or more years in the past. It is a portrait in time *and* place, an archeology of sound. The result of the audio flotsam and jetsam washed up on the shores of low commerce in the flea markets of Lisbon." (Mark Vernon) “Lend an ear, leave a word” arrives in a full color matte stock sleeve with insert and download card that features additional pieces left off the LP due to time constraints. Mastered by Jason Lescalleet in an edition of 400." - Kye. "Memorial release from the Sydney-based duo of Matthauw Hopkins and Christopher Schueler (RIP). Over a handful of lathes/CDRs and the mind-boggling 22 Coloured Bull-Terriers cassette Vincent Over The Sink managed to cloud the backwaters of Australian culture with a haze of rustic elec...tronics, late-night guitar habitats and broken song. This is music made by and for those who find themselves "thinking about music but then digging a hole." Dust Studies offers up four distressed miniatures that put the fortunate listener somewhere between Ladder of Souls and Golem. The perfect place to pay a final respect. Dust Studies comes in a hand-numbered edition of 300 copies with cover art by Graham Lambkin." - Kye.